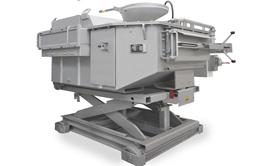 We Buy, Sell and are a Supplier of used dosing furnaces. Dosing furnaces are closed furnaces that minimize heat loss and act as ladles by pouring molten metal into die casting machines. Brands include Lindberg MPH, Rauch, and Stotek. Receive email alerts when new inventory matching Dosing Furnaces become available? Recently Sold Listings in the Dosing Furnaces category.